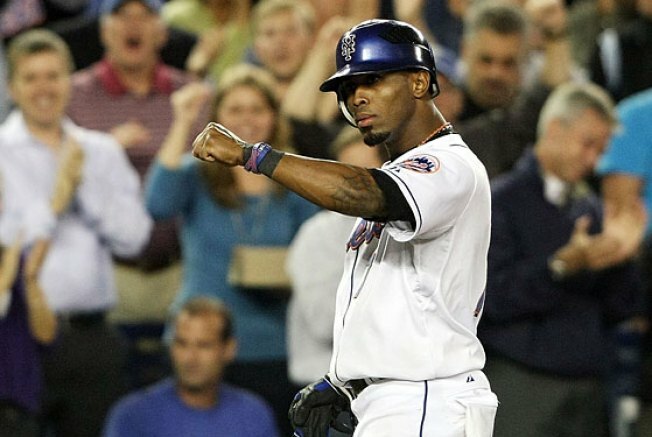 Jose Reyes may need to ward off evil spirits this week. There are five games left in the baseball season, and Johan Santana just saved the Mets' hides (again) last night. The team is one and a half games behind the Phillies in the National League East and one game ahead of the Brewers in the National League wild-card race. Can the team avoid another choke and make the playoffs? Predicting the outcomes of individual baseball games is a fool's errand. But that doesn't make it any less fun! Here's how we imagine the next week could play out, in agonizing detail. The Phillies have four games left, one tonight against the Braves and three against the Nationals this weekend, all at home. For the Phillies to lose their division lead, they would have to split those games and the Mets would have to go 4-1 the rest of the way. (Also, the Mets could win all five and the Phillies could go 3-1. Or the Mets could go 3-2 and the Phillies could go 1-3. You get the drift.) So the Mets are still in the East title chase, but let’s not kid ourselves: The Braves and Nationals are not good teams, and if the Phillies somehow blew their playoff slot in these last few days, it would rival the Mets’ collapse last year. It’s highly unlikely. No, the Mets are best concentrating on holding off the Milwaukee Brewers. (There’s an advantage to winning the NL East rather than earning the wild-card — avoiding the Chicago Cubs, the best team in the National League — but let’s not worry about that right now.) Both the Brewers and Mets have five games left. (If the two teams end up tied, the Mets will host the Brewers in a play-in game on Monday.) The Mets have two more with the Cubs and then three against the Marlins, all at home, including Sunday’s season finale, which, egad, could possibly be the last game at Shea Stadium. The Brewers have two more with the Pirates (whom they dominate at home) before three with the Cubs to finish the year. On the surface, that looks like an advantage for the Brewers, but do not underestimate the importance of that one-game lead. Baseball Prospectus’ Playoff Odds Report currently lists the Mets as having a 79 percent chance of making the playoffs, with the Brewers at only 29 percent. But Mets fans don’t want to hear about odds and likelihood: Last year destroyed any ideas of having anything in the bag. So let’s, for the sake of fun, imagine how the next five days of the season might go, and where it might end. Pirates at Brewers: C.C. Sabathia is pitching on three days’ rest (he’s set to go again in the season finale if needed), against Paul Maholm, the guy who gave up a foul ball to Billy Crystal during spring training. Brewers win. Braves at Phillies: Brett Myers has been great for two months, save for a recent blurp, and he’s facing a Braves team that checked out on the season months ago. Phillies win. Cubs at Mets: The game that hurt the Mets the most in the last week was Monday’s loss to Jason Marquis and the Cubs. Lou Piniella’s team was still waking up from its division-championship celebration and starting one of its worst pitchers … who promptly hit a grand slam. Now the Mets have to face the Cubs’ best pitchers, including Carlos Zambrano, who will be eager to forget a difficult start last week in the wake of his no-hitter. The panic continues. Cubs win. Pirates at Brewers: Interim Brewers manager Dale Sveum, famous to Red Sox fans as the world’s worst third-base coach, openly admits he has no idea who his starting pitchers other than Sabathia will be the rest of the way, and that he’s “winging it.” He really doesn’t have any good options with Ben Sheets unable to pitch until the weekend. If the Brewers end up missing the playoffs, they’ll point to this game, though they’ll have many, many other choices. Pirates win. Cubs at Mets: Can you imagine if the Mets make the postseason but Pedro Martinez — the Pedro Martinez — doesn’t make the playoff rotation? This will be his last audition; he has been drilled in his last three starts. He’s facing Rich Harden, who has been outstanding since joining the Cubs. Here’s guessing that Pedro pitches well enough to keep his name in the postseason mix … but not well enough to win. Cubs win. Nationals at Phillies: The Nationals are throwing their best starter (John Lannan) and the Phillies are throwing their worst (Joe Blanton). Philadelphia still wins, and the fans celebrate their division win at home by punching each other repeatedly in the face. Cubs at Brewers: Still no clue who the Brewers are starting. The Cubs throw Ryan Dempster, who has actually been their best pitcher all season. And don’t worry about the Brewers having a home-field advantage. Miller Park is Wrigley Field North, with almost as many Cubs fans as Brewers fans. Zambrano actually threw his no-hitter there a couple of weeks ago. Cubs win. Marlins at Mets: Florida has surprised a lot of people this year, and they return to Shea for the last series of the season, reprising their nightmarish role of last season. Just to be cruel, they start off on the same note this year, battering a slowly fading Mike Pelfrey early en route to a horrific, gag-inducing third straight loss for the Mets. Marlins win. Cubs at Brewers: This is the game that All-Star Brewers pitcher Ben Sheets is likely to pitch, if he’s ready. Turns out he’s not, and the Cubs’ Ted Lilly, making a claim for a spot in the playoff rotation, shuts down the Brew Crew in front of 40,000 screaming Cubs fans in Milwaukee. Cubs win. Marlins at Mets: This can’t be the role the Mets really want Jon Niese to play right now. He has struggled in his last two starts, and now he’s asked to save the whole season. But this afternoon, the Mets gets some magic from Niese, who, after all, was born the actual day the Mets last won the World Series. (If that doesn’t make you feel old.) The Mets are one win away. Cubs at Brewers: C.C. Sabathia, in what could be his last start as a Brewer, trudges out again on three day’s rest and breezes through a Cubs team that’s ready to fly back to Chicago and prepare for the playoffs. A smattering of Brewers fans cheer. Brewers win. Marlins at Mets: Johan Santana has been the stopper all season, and, considering his success in the second half, the Mets’ savior. He dominates for eight innings, leaving with a 3-1 lead and Shea rocking in postseason anticipation. The bullpen prepares for the final three outs. You know what happens then. Marlins win. That leaves one extra game, the tiebreaker Monday night, between the Mets and Brewers in Flushing. If the Mets win, they exorcise last September’s demons and travel to Wrigley Field. If they lose, the last game ever played at Shea Stadium is the most crushing loss of all. I wouldn’t dare try to predict what would happen in this game. But it’s starting to look like it’s going to happen, doesn’t it? It almost feels like it has to happen.